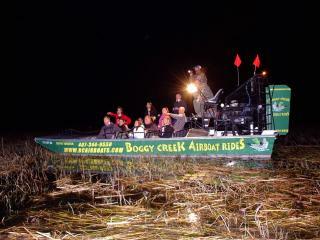 An airboat ride is the best way to experience the beautiful Central Florida Everglades. Just a short drive from the main hotel locations in Orlando, Boggy Creek is a natural wonderland that is home to numerous animal species including the Florida Alligator. Zip through Florida’s wetlands spotting the native wildlife in their natural environment before your pilot cranks up the speed and you fly at speeds of up to 45 miles per hour into the swamps of the beautiful Central Everglades and between walls of tall grass. A very Floridian experience! Traveling at speeds of up to 45 miles per hour see exotic birds, turtles and the Florida alligator all in their natural environment. 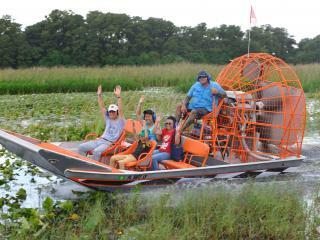 Enjoy the thrill of an airboat ride on the beautiful Central Florida Everglades and discover the natural side of Florida. 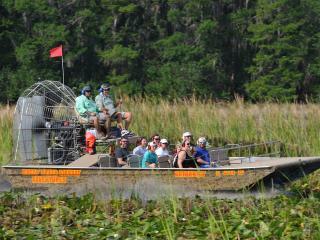 This extended airboat ride takes you further into the wilderness in search of Florida Alligators, turtles, birds and more in their natural environment.